Requirement: HD CCTV System to upgrade the school’s security provision and allow its security team to make full use of the system both within the school and remotely. Eglinton is a unique two form Primary School and Early Years Centre for children aged two to eleven. They are a welcoming, inclusive and a culturally diverse community. They build positive, long lasting relationships and provide continual care, advice and support for our families. Supporting each individual; providing a safe and inspiring learning community for all. Faustina Challans, Business Manager at Eglinton Primary contacted Ecl-ips after seeing an advert in the Headteachers Update magazine. The brief from the first conversation Ecl-ips had with Faustina was the school needed High Resolution CCTV Cameras to cover various parts of the school. Ecl-ips is an established security installer who specialise in IP security systems and have worked with many organisations of all sizes with regards to their security and safeguarding requirements. 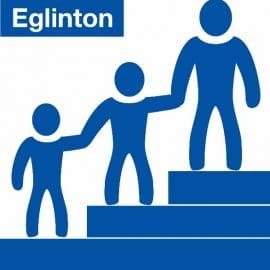 Ecl-ips are an authorised Avigilon partner and were able to work with Eglinton Primary School to help find a suitable solution. After the initial meeting with Peter Smith, Premises Officer at Eglinton, it was clear that a High Resolution CCTV system was required to provide monitoring in areas of the existing school site. The cameras needed to provide good quality and detailed images to enable identification of people within the site. All areas of the school needed to be monitored with particular attention to the main entrances, playground entrances, site managers house and the mini bus parking area. Having met with Faustina Challans, from Eglinton Primary School, we were able to understand the issues that Eglinton faced and what they were trying to achieve from their surveillance system, which was to primarily improve security around the school site and also to safeguard the staff and pupils. “The system is very useful asset for any school or entity to have. Safeguarding, safety and security is covered. The presence of CCTV is serving as a deterrent.” Faustina Challans.